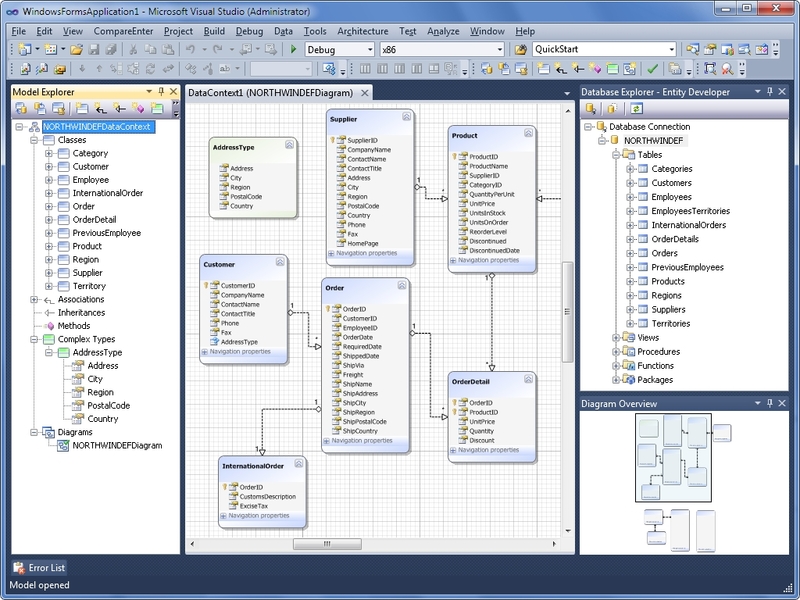 LinqConnect is a LINQ to SQL compatible ORM solution with extended functionality, support for SQL Server, Oracle, MySQL, PostgreSQL, and SQLite, its own visual model designer, seamlessly integrating to Visual Studio, and SQL monitoring tool. 3.2 version of the software supports Fluent Mapping, generates data access layer code and supports complex types, with an ability to create entity properties with internal structure. ...... process. It provides the same interface to all database servers, enabling users to easily develop applications that are able to use different databases. LinqConnect 3.2 introduced a function of customization of the default Type Mapping Rules. It also presents a significantly improved Entity Developer. The new version LinqConnect 3.2 provides documentation generation for Enum members was added. The updated tool allows its user to set such options as Environment, Diagram and Servers' to adjust the Entity Developer behavior, Model diagram behavior to your needs. Qweas is providing links to LinqConnect 3.2 as a courtesy, and makes no representations regarding LinqConnect or any other applications or any information related thereto. Any questions, complaints or claims regarding this application LinqConnect 3.2 must be directed to the appropriate software vendor. You may click the publisher link of LinqConnect on the top of this page to get more details about the vendor.